The WHOLESALE BUYERS area of the Maine Made site is accessible via the primary navigation located at the top of the site. Using this area’s key features (WHOLESALE SEARCH and BUYER FAVORITES) requires that you register as a wholesale buyer which establishes a unique account for you on the site. You must have a Resale Certificate Number in order to register as a Wholesale Buyer which will be required in order to register. 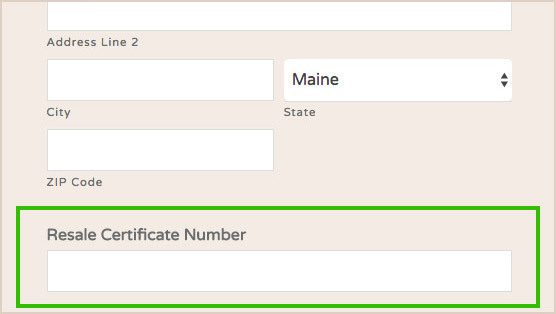 Once you have successfully registered with the Maine Made site, you will receive a personalized Password Retrieval confirmation email. This will bring you to a simple page that displays your temporary system-generated password in the single field on the page. It is important that you change this password to a unique personal password of your choosing. PLEASE NOTE: Passwords are case-sensitive. To change it, place your cursor in the password field and delete the entire existing system-generated password, then type in your new password and click the SAVE PASSWORD button at the bottom right to complete the process. PLEASE NOTE: We suggest that you save your password in a secure location on your computer or that you physically write it down and store it securely. Once the save process completes and the page refreshes, click the Back to Maine Made link at the bottom right of the page and then, once returned to the site’s homepage, place your cursor over the WHOLESALE BUYERS link in the site’s navigation and click on the MY BUYER FAVORITES link in the corresponding dropdown menu. Use your email address and newly chosen password to login to your account and you will arrive at the Personal Favorites landing page. The Buyer Favorites feature works in conjunction with the Wholesale Search area to make finding, saving and returning to your favorite Maine Made member profiles a seamless and intuitive process. To access Wholesale Search, one you have logged in, simply navigate to WHOLESALE SEARCH in the dropdown under WHOLESALE BUYERS. The resulting page allows you to search our database of members who offer wholesale purchasing using a variety of criteria (Keyword, Town/City, Category and Region). Favorites list. You can add as many favorites as you like using the method described above. 1. Scroll to the bottom of your Buyer Favorites page and find the 2 column Manage Your Favorites list. All members appear on the left, your selected members appear on the right. 2. To remove a member from your list, select the desired member in the list on the right and click on the circular black minus sign that appears to the right when the member name is highlighted. 3. To complete the process, click on SAVE MY FAVORITES. Leaving the page without clicking the save button will mean any changes made will not be saved.